Cleofe -- that is how she signed her name in three of the four letters we have from her -- may not have dressed like this Greek bride. Her Italian dress was one of the problems that came up. But perhaps she allowed herself to be adorned for the wedding celebrations at Mistra in February 1421. Was that before or after she learned that her bridegroom had made a vow to live in chastity for six years (and not eat meat which, presumably, would inflame his sexual desire)? Was the vow made before he met her, or after? Everyone agreed she was beautiful and very bright. She is reported to have been tall. Theodoros was probably shorter than average, like his father and brother John. He was awkward and immature, raised by clerics and professional intellectuals who taught him mathematics and theology. He knew nothing about women, except that they were occasions for sin. One can imagine him pudgy, possibly a little nearsighted, and absolutely terrified by the gaiety and charm of this young woman they had shipped in for him for the benefit of his father's political arrangements. Perhaps the wedding night was a disaster and he found a vow a great relief. We don't know. We do know that Cleofe was miserable because her letters say so, and the women in her family wrote each other that she was. Four of her letters survive, as well as one from her sister Paola, and two from their sister-in-law Battista. These were highly literate women: there must have been many more and our view of her life and marriage might be profoundly changed if we had them. Finally -- despite the letter Theodoros had written the Pope guaranteeing she could maintain her religion and her Italian customs -- she, after much pressure from him, took to wearing Greek dress and was received into the Orthodox church. She took up fasting according to Orthodox practice. This is where it gets complicated. Jacomo de Sancto Angelo from Padua talked to Cleofe when he was in Mistra, and reported to her brother in Patras that she had said, "I have not become a nun, just because I was anointed with a little oil. My heart is as free as it ever was." And Christofano, another friend of her brother, commented that she could dispute religion so well she could corrupt a lamb, and that she was the most perfidious Greek in the world. Most writers misunderstand this last phrase and take it that she had "betrayed her faith," but Greek perfidy has been a catchphrase ever since the Trojan horse, and everyone who has studied Latin, and many who haven't, knows "Timeo Danaos et dona ferentes." Cleofe made such a performance of being a devout Orthodox woman that her husband and his courtiers were deeply impressed. He had grown up without women and couldn't have been expected to know better, but it also suggests that the Greek aristocratic male mindset saw categories of women rather than individual people. Or perhaps no one who caught on to the truth wanted to make more difficulty for her. Whatever the tensions between Cleofe and Theodoros, she was allowed much personal freedom. She had books and music. She wrote. She talked at great length with various men who visited Mistra, and gave them intimate information to take back to her family. Her letters told Paola and Battista that Antonio da Fossombrone, Conte Ricardo, the Mega Kartophylax, were bringing messages. She was moody. In three of the four letters -- no longer than would fit on a postcard -- she says she does not have time to write more. The four letters date from October 1426, January 1428, March 1428, July 1428. The marriage was complex, more complex than I have seen recognized in print, and the period of abstinence was not one of calm. Her sister-in-law Battista wrote the Pope about "internecine warfare" and wanted him to interfere. This is a clue that Cleofe was not simply a victim. She remembered that she was a Malatesta. The Malatesta did not go as lambs to the slaughter. She threatened to leave him, delivering literary tirades, or being ominously silent. Everyone knew that his brother John's wife had left him because he ignored her: John, in fact, wanted her to leave. Perhaps Cleope threw Theodoros' math manuscripts out the window. One hopes so. But Theodoros must not have actually wanted her to leave. A year after the six years of abstinence were completed, in the January 1428 letter, Cleofe refers with anxiety to her pregnancy. She was very close to delivery. She may have been normally concerned, or she may may have been aware of potential difficulties. The second pregnancy killed her. The March letter is a long and wrenching train-of-consciousness. She was desperately lonely for her sister. She begged for letters, about the children, about anything that has happened. She asked as a favor, but if she doesn't get letters from home, she will die. She hoped God would confine her unhappiness to this world. Her life was bitter, she was worthless. She could not stop crying. There was not enough paper to record her unhappiness. The only consolation she had is from her baby daughter -- this a bare mention at the end of the letter-- but no consolation comes through to the reader. If there ever were a portrait of post-partum depression, this letter is it. The letter has not previously been read with this interpretation. The letter has one more point of interest, and that is the signature. Her usual signature was "La vostra sorella Cleofe Paleologhina," but this one she signed as "La vostra sorella Cleofe Paleologhina. Deo gratia, vasilisa della Morea." Theodoros gave her a title when Helena was born, βασιλίσσα, and she was proud of it, and she spelled it the way it is pronounced with a V for the B.
Theodoros must have been frightened. They were parents and he knew that should have been a source of joy for both of them, but he was afraid and she wouldn't stop crying. He couldn't handle the situation. The intensity of his own emotions was too much, and he talked about retiring into a monastery. He had been talking about it ever since she became pregnant. The monastery would have been pretty much the same kind of life he had at Mistra before Cleofe arrived, only without the burdens of ruling and having interpersonal relations. This is at least the third example we know of his choosing retreat when confronted with crisis. When they were making him into a boy ruler and intellectual, no one considered that his heart needed education, too. Several years earlier, in the summer of 1423, when an Ottoman army invaded the Morea and came all the way to the walls of Mistra, he had thought he would go into a monastery. This most recent time, his family took it so seriously, that his brother Constantine had arrived in December to take over. He decided not to retire. He hung on, and during the next year and a half, his brothers conquered their rivals for power in the Morea and doubled the size of the Palaiologos holdings in the Morea. The family had acquired glory and apparently considerable wealth. Theodoros became wonderfully exhilarated and thought ruling had definite appeal. Cleope's father came to visit. One can imagine that when he went back to Italy he sent Theodoros an architect, because this was the period when the great Italian wing of the palace was built at Mistra. Somewhere in here, things changed between Cleofe and Theodoros. Perhaps planning for the new palace allowed them to discover how well they could work together. They studied poetry together, wrote it. Her father was a well-known poet, Petrarch had been a family friend. Theodore developed an interest in Italian poetry. She became pregnant again in 1432, probably in August or September. It is not clear just what happened -- probably the foetus died before it could be born, perhaps Dr. Pepagomenos interfered more than his skills warranted and gave her puerperal fever. Cleofe suffered for days. 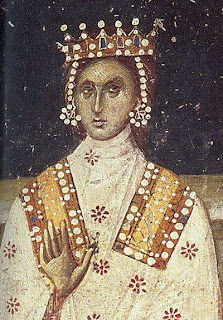 Theodoros sat with her, holding her hand until she died on 18 April 1433. Theodoros' heart was broken. He wrote a poem to go in her tomb and from it we get hints that whatever the fears and furies that had been between them, they had become lovers and companions. The primary sources and a bibliography for the Theodoros and Cleope story can be found here. The poem and its sources can be found here.